The old order changeth, yielding place to new?! If it wasn't for Victorian poet Alfred Lord Tennyson's soulful reference to life after the mythical King Arthur, it would be equally apt for India Inc. The history of corporate India is one of tireless change. Nowhere does it reflect better than in the annual rankings of corporate performance - the BT 500. 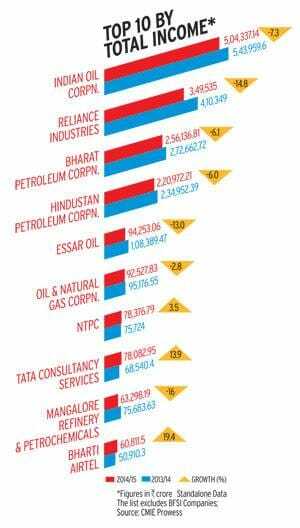 This listing of India's largest companies by average market capitalisation over the past six months remains the country's most authentic barometer of swinging fortunes in India Inc.; of how the stock market rewards performance - and penalises the laggards. In today's competitive world, companies need a lot more than just status quo to be in the reckoning. Reputation can be fragile and the podium can be slippery, as evident from the BT 500 ranking over the years. In fact, ground reality can be painfully bitter at times. Only five of this year's top 10 figured here have survived the past decade to retain their place in the Top 10 since the 2005 ranking. These are: Reliance Industries, TCS, ITC, Infosys and HDFC. Tata Consultancy Services was always a bellwether stock. The No. 5 of 2005, Bharti Tele-Ventures (now called Bharti Airtel) made the $10.7 billion acquisition of Zain's African telecom business but is still to digest it; Hindustan Unilever continues to experience growth pangs as innovation dried to a trickle; ICICI Bank sacrificed growth to consolidate its skewed balance sheet and runaway NPAs under the new CEO Chanda Kochhar; and, Tata Steel, which is struggling to digest and revive its $7.6 billion acquisition of British steel maker Corus. "Commodity and real estate companies have been affected by market conditions. Infrastructure companies have suffered from regulatory and court-related problems," says Motilal Oswal, Chairman and Managing Director, Motilal Financial Services and Motilal Oswal Securities. But this decade was about TCS breaking away from the quartet of Indian IT services majors (TCS, Infosys, Wipro and Satyam), having spent several years joined at the hip with these firms. As TCS upped the ante by making a swift transition from geography-based strategic business units (SBUs) to sector-based SBUs, it kept widening the gap, while its peers struggled. Interestingly, there was a time back in 2005 when, on November 11, to be precise, Nandan Nilekani-led Infosys had overtaken TCS to be the second most valuable company in India after Reliance Industries. But that was just that, a momentary surge for Infosys. 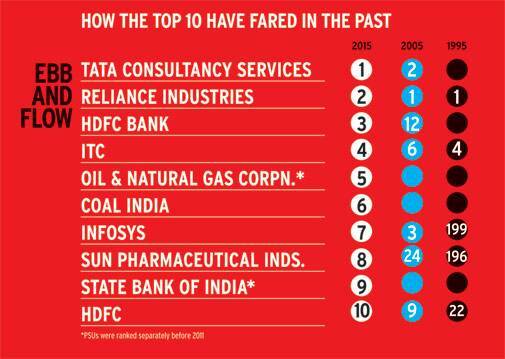 Since then, Infosys has slipped to No.7 and Wipro slipped out of the Top 10 between 2005 and 2015. Consider the economic context in which this massive churn was taking place: The world had gone through a once-in-a-lifetime event in the Lehman crisis that crippled the American banking system and sent a majority of global economies into shivers of recession and slowdown for more than half a decade. As a result, the global economy went through one of the biggest commodity boom and bust cycles where oil prices, for instance, rose to the peak of $145 per barrel before crashing to a low of $44 per barrel. Europe continues to struggle on the path of recovery and weaker European economies faced an unprecedented sovereign debt crisis, dragging down richer European economies. 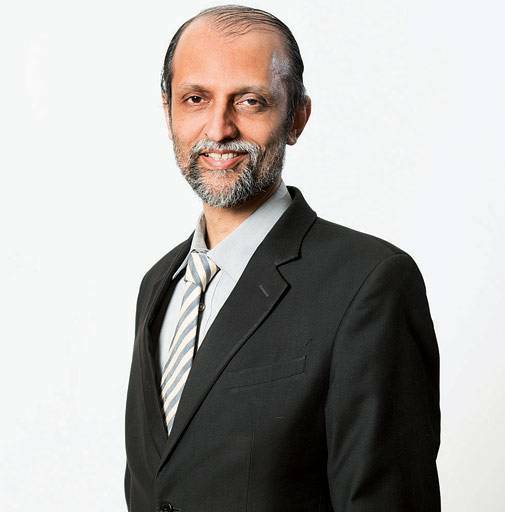 "These have been the most trying years for the world economy," says Ajit Ranade, Chief Economist, Aditya Birla group. But this was also a decade of excesses and a never-before opportunity to create wealth. 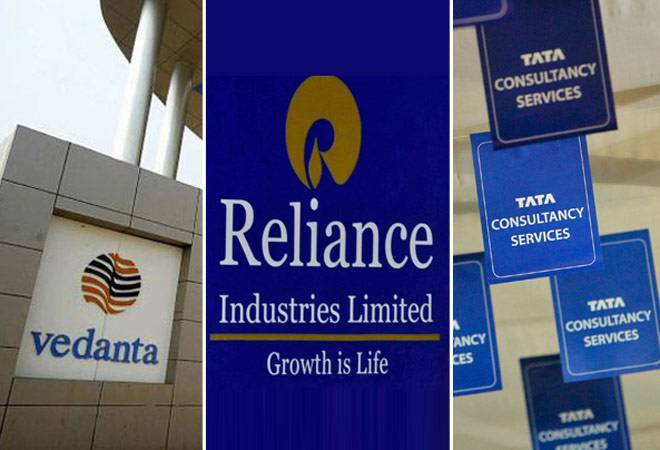 Between 2005 and 2015 rankings, the total market capitalisation of BT 500 companies shot up nearly eight times from Rs 12.52 lakh crore to Rs 95.29 lakh crore, adding over Rs 83 lakh crore of wealth in these 10 years (in the previous decade up to 1995, the total market capitalisation of BT 500 companies grew just four times). But while the BT 500 market capitalisation shot through nearly 800 per cent between 2005 and 2015, India's GDP rose only 358 per cent during the same period. Government of India's gross receipts grew 335 per cent and gross expenditure went up 337 per cent. A majority of this wealth has been created by tech companies such as TCS (whose market cap has gone up from Rs 62,463 crore to Rs 5.01 lakh crore and Infosys (from Rs 60,000 crore to Rs 2.4 lakh crore). 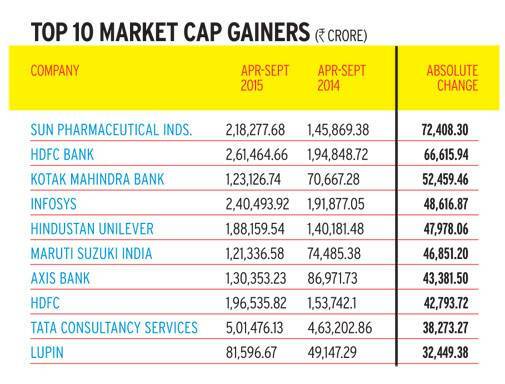 Also, banking giants SBI (Rs 2 lakh crore) and HDFC Bank (Rs 2.61 lakh crore), which have risen to the Top 10. Or, for that matter, newly listed firms such as Coal India (Rs 2.41 lakh crore) whose stock was not being traded a decade ago. Ranade says the Lehman crisis worked to the advantage of PSU banks such as SBI. "General public transferred their cash from private banks to PSU banks fearing a Lehman-like impact in India," he says. "However, HDFC Bank wasn't affected because of strategic management and capability. 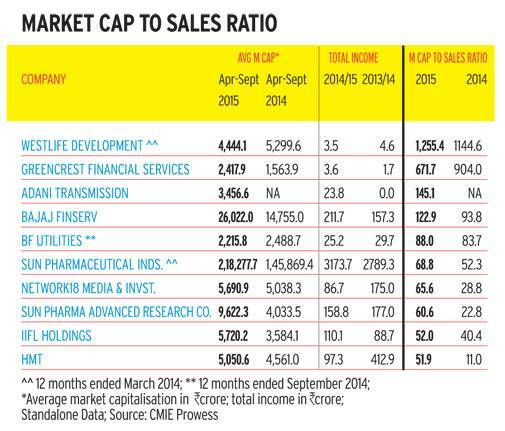 It also had the most balanced portfolio between retail and corporate customers." 'Technology has defi nitely taken over. 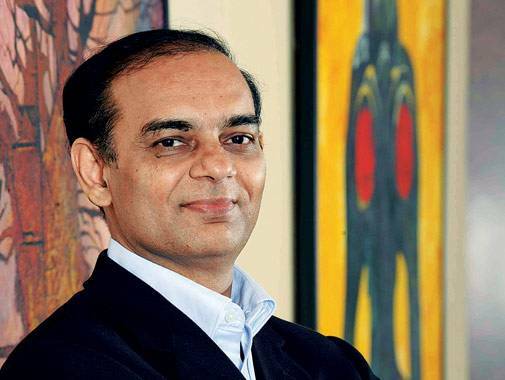 Those who have been able to transition to technology are faring better,' says Motilal Oswal, Chairman and Managing Director, Motilal Financial Services and Motilal Oswal Securities. Now, that was about the changes in the past decade. 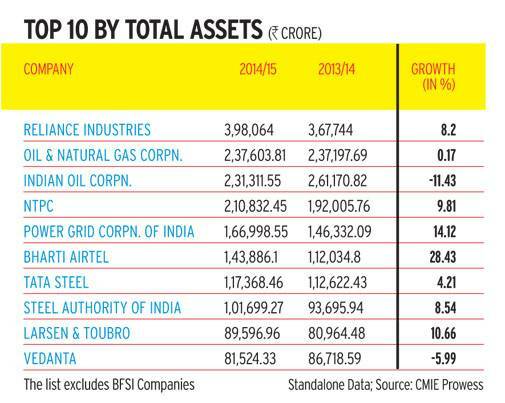 Look back the decade before 1995, and the 2015 list is down to just two survivors: Reliance Industries and ITC. Guess who slipped out of the Top 10 as others set a scorching pace of topline growth and stock market valuation: It's the legendary FMCG major Hindustan Unilever, which was at No.2 two decades ago; Tata Steel; engineering giant Larsen & Toubro; Tata Motors (earlier called Telco), which hasn't produced a winner in the marketplace in a long time; Bajaj Auto, which made the fatal mistake of exiting the scooters business (where it was the market leader) that now accounts for over 60 per cent of several urban markets and over 20 per cent of the entire two-wheeler industry. Bajaj continues to ignore the segment and has no offering for the customer; Colgate-Palmolive; Hindalco and Grasim. Inarguably, the 2025 list will be dramatically different from this year's. It could well be the decade of tech or tech-enabled businesses rather than the brick-and-mortar heroes of the past. "Technology has definitely taken over. Those who have been able to transition to technology are faring better," says Oswal. Listed Flipkart or Snapdeal could find themselves up there, or the fast-growing and highly-profitable IndiGo, which is preparing for a listing soon. Not to forget an Ola or OYO! Can govt realize the dream of supplying power 24x7?